Perennial hibiscus, or rose mallow (Hibiscus moscheutos), is native to the moist soils of the eastern United States. It is remarkably hardy, growing in cold regions to the subtropics, in USDA hardiness zones 5 through 10. Plant perennial hibiscus in full sun in moist, fertile soils in a hole that is as deep as the root ball but twice as wide. Perennial hibiscus is a fast-growing plant that although regarded as herbaceous, can attain wood-like stems at the plant base. Its flowers occur in the heat of summer until frost, some blossoms reaching the size of a dinner plate, upward of 12 inches in diameter. This species always dies back in winter, even in mild climates, and regrows upon the return of warmth in spring. Several cultivars have been developed and are revered for their garden performance, vigor and amazing flowering: Lord Baltimore, Lady Baltimore, The Clown, Crimson Wonder, Turn of the Century and George Riegel are widely available at garden centers. Dwarf series and selections are increasingly available, too. Peruse your garden for a sunny location, one that receives at least six to eight hours of direct sunlight each day. Spots that receive dappled light or less than six hours of sun will still support leafy growth of the perennial hibiscus, but flowering will be markedly reduced or absent. Choose a location that also has a fertile, moist, but well-draining soil. 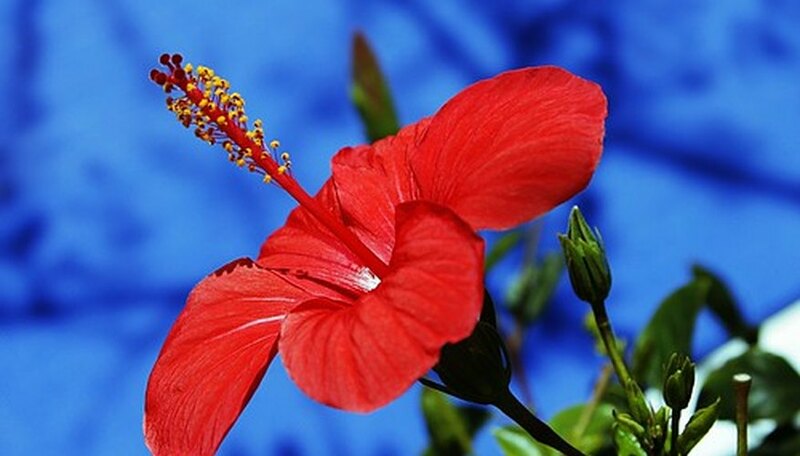 Although this species of hibiscus is tolerant of soggy soils, its success and longevity in the garden is best in organic-rich soils that remain moist but do not become dry in droughts or soggy or flooded after rainstorms. Amend sand and clay soils with copious amounts of compost, well-cured manure or leaf mold to improve drainage and fertility. Measure the container of the perennial hibiscus you are to plant. Dig a hole in the location you chose that is the same depth as the container. Be aware that the root ball of the plant may be smaller than the container; look for a rim in the container that is about 1 to 2 inches above the height of the soil of the root ball. Make the hole twice as wide as the diameter of the container. Making the hole even wider is not a bad practice, as the loose soil is more advantageous for the plant to grow its roots. Remove the plant from its container by inverting it and gently shaking the root ball out. Scratch the sides of the root ball with your fingers to break and loosen no more than 1/2 of all roots on the ball's edges. Upright the plant and place it into the hole, double-checking to make sure the top of the root ball matches the soil level at the top of the hole. Replace the soil into the hole, tamping it down gently with your fingers as you fill the hole. Once the hole is full and the soil level is even with the top of the root ball, create a small berm moat around the plant to create a reservoir for irrigation water. Add one to three gallons of water to the plant reservoir and allow it to soak in fully. Add more soil to the planting area if the soil compacts and becomes lower than the edges of the root ball. Apply an organic mulch around the base of the perennial hibiscus to deter weeds, retain soil moisture and moderate soil temperatures. Keep mulch or compost at least 3 inches away from the base of the plant, however. Monitor the planting hole for moisture, adding one to two gallons as needed to keep the soil moist, never soggy or bone dry. Once the plant has been in the ground for at least two weeks, start applying a liquid fertilizer watering every two to three weeks in a dosage recommended on the product label. Fertilize regularly during the late spring, summer and early autumn to encourage flowering. Stop fertilizing once an autumn frost is expected. Do not fertilize the plant in winter when the plant is dormant. In late winter, cut off all stems to a height of 4 to 6 inches with a pruners. Allow the plant to rejuvenate with the return of spring's warmth. Replenish a 2- to 3-inch layer of compost or organic mulch around the base of the plant each spring as new growth emerges.